Bitter and salty flavors are blended together in this unique and highly nutritious salad from Vincent Yap at The Westin, Philippine Plaza. 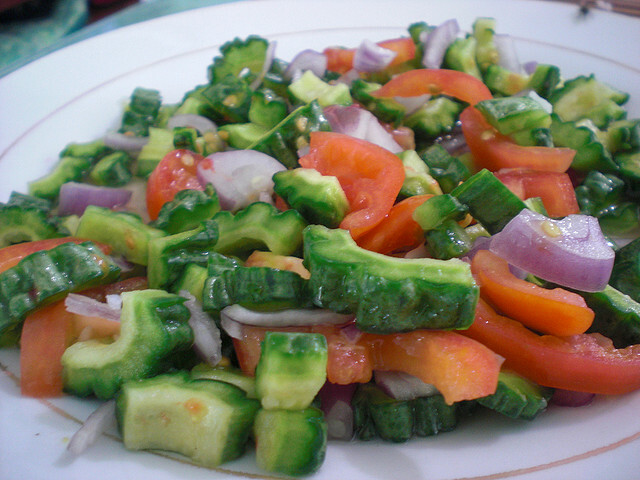 This salad makes a refreshing appetizer, although the bitterness of the melon and the strong flavor of the fermented baby shrimp (bagoong alamang) may take some getting used to for non-Filipinos. 1 Sprinkle the bitter melons with the salt and place them in a colander for 30 minutes to drain. Rinse off the salt and dab the melon slices with paper towels to remove excess moisture. 2 In a large mixing bowl, toss the melon slices with the remaining ingredients. Allow to stand for 10 minutes to let the flavors develop, then serve.